1. Do you need to minimize planned downtime? Every system operator wants less downtime, but some mission-critical operations strive to minimize planned downtime as much as possible. A replacement will require more downtime because it requires the removal of old switchgear infrastructure. By contrast, an upgrade requires minimal planned downtime because the existing structure remains intact. 2. Is finding budget for the project and justifying the expenditure problematic? An upgrade is an operating expense and typically easier to fund than switchgear replacement, which is new equipment and requires capital funds. Upgrading costs less because the existing footprint remains, and retrofits can be paid for over time. Upgrading can even be a cost-effective solution for older switchgear that is hard to reach or requires unique configuration. Replacement requires the purchase of new equipment, moving conduit, structure reconfiguration and testing. The upside is new infrastructure, but be prepared for higher costs and bigger upfront expenses. 3. How to mitigate risk for your modernization project? An upgrade is lower risk because it requires fewer project hours, less site preparation, less disposal management and less hands-on manipulation of cables and other electrical equipment. A total replacement results in more material waste, which must be properly discarded or recycled. New switchgear can require new or spliced cabling, which also increases risk. 4. Do you require latest equipment capabilities? Replacing old equipment with new equipment provides an instant modernization to the latest standards, but modernization to the latest standards also comes with upgrades. Safety, communications and other standards are updated. Dive deeper into available solutions for upgrade and replacement, and document actual cost, downtime requirements and other details with our new tool. 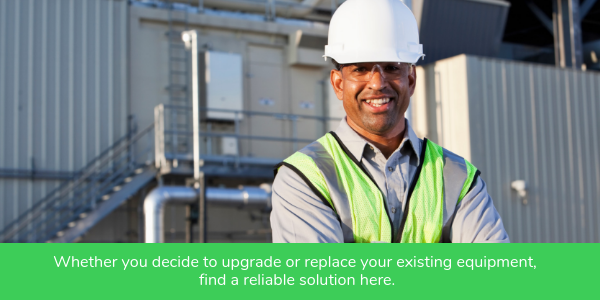 Whether you decide to upgrade or replace your existing equipment, you’ll find reliable solutions at Schneider Electric. Talk to our technical experts today about your unique project needs.